I hesitate to use Andy’s name here (though I’ll probably get far more clicks than normal). It is, of course, fun to throw megachurch pastors under the bus. But it’s a bit cheap too. I typically avoid it. The truth is, Andy Stanley has occasionally gotten himself into trouble for saying controversial things. Not too long ago he had to make an apology for talking disparagingly about small churches. While his comments were “absurd” (his word), I think we can also recognize that he, and others like him, will always be under the microscope of critique. It’s not that everyone is mean – well, I suppose there is that too – it’s just that he’s listened to by so many people. There’s no way that something will just ‘slip under the radar’ when your listenership is in the millions. So sometimes we nitpick. This time it’s a bit different though. Stanley’s not under fire for saying something that is merely controversial, he’s dabbling in an ever popular heresy called Marcionism. In a recent sermon, he spoke of how Christians need to become “unhitched” from the Old Testament. Wesley Hill wrote a fair article about this here. The purpose of this blog is not to delve into the mechanics of Marcionism or neo-Marcionism. What I’m after is how on earth a megachurch pastor can get to the point of saying things like, “God’s arrangement with Israel should now be eliminated from the equation.” This is super dangerous not simply because many church-goers come to believe this stuff, but also because it is a step backward in our Jewish-Christian relationships. This is not nitpicking. Someone had recently posted an article on Facebook from a scholar asking if churches should ever consider adding a “theologian in residence.” Most of the comments I saw were either ‘meh’ or ‘who could afford that luxury and what on earth would a theologian in residence possibly do?’ Here’s the thing friends, we hire “music pastors.” I was a music pastor for nearly 20 years so trust me, I’m thankful that churches hire people like me. Admittedly, I did a lot of other pastor duties including preaching, teaching, weddings, funerals, and hospital visits. But not every music pastor does this. Some are focused completely on music. Some churches even have a “musician in residence.” Again, I’m not downplaying this role per se, I’m just confused on how we can so quickly toss aside the idea of a theologian being on a church staff while we can seemingly hire for just about any other position you can imagine. Both Christians and Jews can confess that we have radical differences (see, for example, point 6 of this incredible document signed by over 70 influential Rabbi’s). But how we express that difference is really, really important. At the end of the day, I don’t think a theologian in residence is the fix-all solution to the churches problems. At the root of the problem of our bad preaching usually lies the great rift that has occurred between the church and the academy. 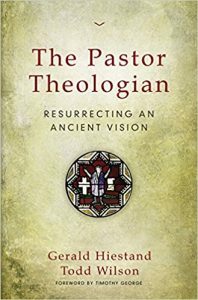 I’m really grateful, by the way, for those calling us to renew the role of Pastor-theologian (see recommended reading on this below). But in the meantime, if your church has the funds, why not consider hiring a theologian on some level? They can help write curriculum, preview (and preach) sermons, and host theological discussion nights (just to name a few ideas). Can’t afford to hire a theologian? Why not build a relationship with one. Really, they’re not that scary. And hey, they might save you from some embarrassment on the interwebs. Just a thought. Two great books on the Pastor-Theologian to check out. Great post, Phil! I agree with you, and would even go as far as saying that when churches hire or even call pastors, they should see themselves as hiring/calling theologians. Great to hear from you Andres. I agree with you. Unfortunately, I think we have a long way to go in some of our churches. Our mainline churches often do a better job of seeing the intersection of Church and academy, as well as the need to help pastors further their education. Still, there have been some encouraging signs. Grateful for people like you who are living this out! Great thoughts Phil – thanks for this.